This month, we’re showcasing the Linn DS range of digital music players, which currently include Akurate, Majik, Klimax, and Sneaky. Last week, we took a closer look at the Akurate DS (you can read all about it in this blog post), and this week, it’s the turn of the Klimax DS to take centre stage. Linn’s DS music players are known throughout the world for their first-class performance, and here at Rococo Systems, we know their capabilities inside and out. Once you’ve connected your chosen player to your home network, you’ll be able to sit back and enjoy listening to your favourite CDs, music downloads, and internet radio channels in studio quality. The Linn Klimax DS was Linn’s first ever DS player, and it still sets a high bar for other networked music players. It enables you to stream digital music over your standard home network and delivers an uncompromising audio performance thanks to its well-earned place at the top of the Linn DS range. The Klimax DS is the perfect companion for your existing separates system. 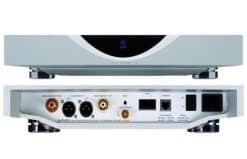 However, you can also connect it directly to Linn’s Klimax 350A or 350P speakers. Plus, you can connect it to any games, movie or audio source using its digital and analogue outputs to produce an incredible sound experience. You’ll see internet radio and online music services such as iTunes and Spotify in a whole, new light when you experience them using the Linn Songcast app on this world-class digital music player. You can even browse your personal music library via a tablet or iPad and compile playlists featuring your favourite tracks. Through the use of Linn’s built-in Space Optimisation technology, you’ll only hear the music you want to listen to, not the unwanted effects caused by the layout of your room. In fact, Linn is so confident you’ll be thrilled with the perfect performance of your Klimax DS player that it’s included a five-year warranty in the purchase price. The sculpted cabinets of Linn Klimax 350 speakers house six channels of Linn’s patented Chakra amplification, which results in less visible cables and superior audio quality. Each cabinet is finished by hand and can be purchased in a range of finishes to ensure a perfect match with your home décor. At Rococo Systems, we love sharing our knowledge with our customers almost as much as we love the music and cinema systems that we sell. We want everyone to walk out of our London and Essex stores with the best customer experience possible. This is why we have our own dedicated Linn lounges, where you can enjoy an in-depth demonstration of our DS players free-of-charge. There’s no obligation to buy, but we do ask that you book your demonstration in advance by calling our Essex office on 01277 890 888 or our London office on 020 7454 1234. Alternatively, you can book your demo online now! Rococo is one of the UK’s leading custom installers of Audio Visual and Home Automation. Based in London and Essex, working… throughout the UK and Europe, we provide a complete service to home owners, property developers, architects and interior designers. For help and advice on choosing the right home entertainment system for you, get in touch with the experts at Rococo Systems. Copyright © 2018 Rococo Systems. All Rights Reserved.